These are the varied claims of a small, yet growing and dangerous, group of AIDS denialists Seth Kalichman exposes in a new, popular press book, Denying AIDS: Conspiracy Theories, Pseudoscience, and Human Tragedy. 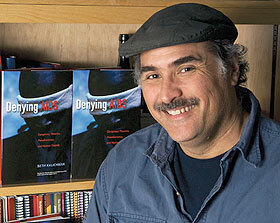 Professor Kalichman discusses his new book Denying AIDS: Conspiracy Theories, Pseudoscience, and Human Tragedy. “This book doesn’t aim to refute the AIDS denialist movement. The science of HIV/AIDS is established fact,” says Kalichman, a professor of social psychology at UConn. Denying AIDS is the first book to offer an American perspective on AIDS denialism and to examine its harmful influence on some of the countries hardest hit by the epidemic. In addition to “diving into the world of AIDS denialism” through books, magazines, and the Internet, Kalichman corresponded and conversed with proponents of AIDS denialism to gain insights into the movement. Most scientists are surprised to learn that AIDS denialists still exist, according to Kalichman. AIDS denialism, however, is a growing problem, and it is propped up by AIDS “pseudo science” circulating largely on the Internet through web sites, blogs, and even pseudo-scientific journals made to look like their legitimate, peer-reviewed counterparts. Creating the illusion of credibility are a small group of professors with ties to well regarded universities, supportive articles in mainstream media outlets such as Harper’s Magazine, and celebrity endorsements, such as from the popular rock band The Foo Fighters, Kalichman writes. A 2008 Harvard University study used mathematical modeling to determine that 365,000 South Africans died as a direct result of former South African president Thabo Mbeki’s refusal to provide antiretroviral medications to treat HIV-positive patients and to prevent pregnant women from infecting their babies. Mbeki became an AIDS denialist after exposure to American denialists through the Internet. A 2007 study by researchers at the U.S. Centers for Disease Control and Prevention found that 40 percent of gay men surveyed in four major U.S. cities agreed with the statement “HIV does not cause AIDS,” despite the fact that gay men are regarded as one of the best educated populations with regard to HIV and AIDS. Kalichman shines a light on the erroneous reasoning and unscientific approaches of AIDS denialists and explains how the denialists nevertheless gain ground. They are masters of rhetorical devices and focus on communicating with the general public. Scientists, by contrast, tend to communicate better with each other than with the general public. Denying AIDS, a trade book published by Copernicus Books/Springer Science and written with a science journalist as a coach, seeks to reverse that trend. In his final chapter, Kalichman offers tips for evaluating the claims of AIDS denialists, including: avoid falling into “single-study fallacies;” consider where information is published and how dated it is; don’t give credibility to information simply because it sounds technical; and use common sense. “Think about the gay men who never used drugs, who had been perfectly healthy and died of AIDS before there were antiretroviral medications …,” he writes. When he is not delving into the world of AIDS denialism, Kalichman, a principal investigator at UConn’s Center for Health, Intervention and Prevention (CHIP) and director of the Southeast HIV/AIDS Research and Evaluation Project (SHARE), conducts HIV/AIDS prevention and treatment research in Atlanta and South Africa. He is donating the proceeds from Denying AIDS to the Family Treatment Fund, administered by Massachusetts General Hospital, to purchase antiretroviral medications for people living with HIV/AIDS in Africa.